I’m egg-static to share some of my very favorite egg recipes. While spring inspires this blog, these tried and true, delicious recipes are not only fantastic any time of year, but also any time of the day. They’re satisfying, but not heavy and set you up for successful eating every time. You need 15 minutes of inactive time to make the perfect hardboiled egg. Basically you arrange your eggs in a single layer in a pot, cover them with water and when they come to a boil, cover the pot and remove them from the heat. Wait 12 minutes, cool under running water and peel. 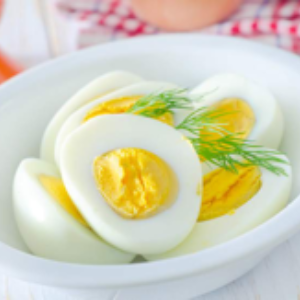 At LMN we tell our clients to make a dozen hardboiled eggs on the weekend, store them in an airtight container and serve them up for breakfast or snack during the week. They last about 5 days. The egg obsession of the moment is a Le Pain des Fleurs crisp bread topped with a perfectly sliced hardboiled egg and – here’s where you get your creative on – add a layer of cheese, sliced tomato, cucumber slivers, avocado mash, spinach or arugula. Kids and grownups will love this savory treat and the convenience can’t be beat. It takes less than 5 minutes to prep. If you haven’t already tried it, you won’t need water wings to enjoy an avocado boat. An egg baked in a halved avocado, this beautiful dish epitomizes spring and while it’s easy and casual enough for a no-stress breakfast, it also dresses up beautifully with a frisee salad and sliced fruit for a shmancy brunch at your place. If you’re a frittata lover, you’ll adore our egg muffin cup recipe. This is the perfect meal to pull off if you have leftover veggies from the week and want to repurpose them into fabulousness. It’s a recipe for genius. Chop your veggies and scramble up some eggs. Pour into muffin tins (yes, you have to oil the pan or use silicone muffin cups, paper liners don’t work) and bake them off to perfection. Pop one out for a snack with some crudités or eat two for breakfast with a cup of berries. Motivated to try these? Eggcelent. Enjoy!